It has been said that “what doesn’t kill you makes you stronger.” Skyridge felt the true sting of that statement during the 5A state championship game on Friday. Challenges came early in the game for the Skyridge Falcons when Blayden Togiai was flagged for two personal fouls. The fouls cost the Falcons 30 penalty yards and led to a field goal for the Corner Canyon Chargers. This put the Chargers on the scoreboard first and the Falcons played catch up for the rest of the game. 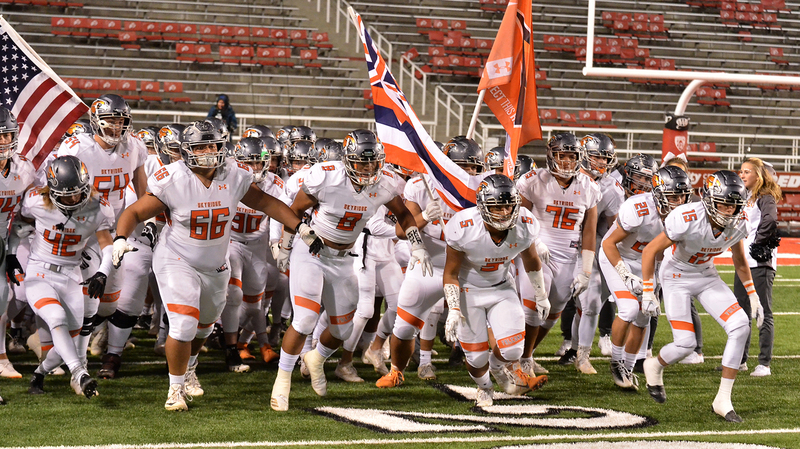 Penalties were only the beginning of the difficulties Skyridge faced ae as they battled the Chargers for offensive progress. The Chargers’ defense was well prepared, and it paid off big as they made offensive ball movement extremely difficult for the Falcons. The Chargers limited running back Ma’a Notoa to just 12 yards on 10 carries in the first half and 34 yards for the game. 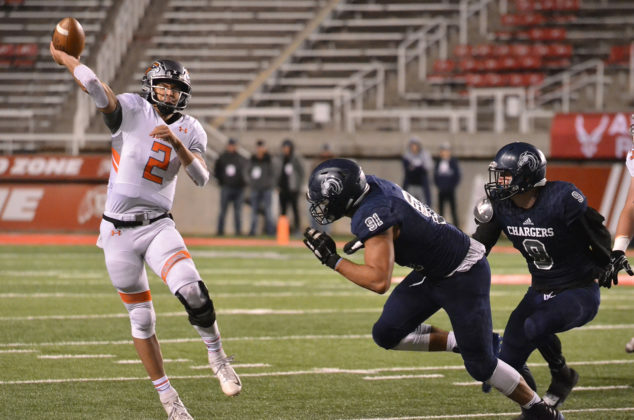 Quarterback Jayden Clemons was frustrated by the Corner Canyon defense as well. Clemons ended the game with 19 carries, 88 yards, and one touchdown. Dylan Samuels was a bright spot in an otherwise dismal night for the Falcons with a brilliant 40-yard catch that led to a two-yard touchdown by Notoa. Niko Toilolo picked off a deflected pass by the Chargers. The pass was broken up by Malae Tanuvasa. Ty Arrington also played well and ended the game with four catches for 57 yards. Clemons gave it all he had in the pursuit of a victory. Trailing, the Falcons moved the ball down the field to the Chargers’ two-yard line. The call was made to go for it on fourth-and-goal. The Falcons came up short on the attempt however, as Clemons’ pass into the end zone was deflected by Charger defensive back, Andrew MacDonald. Clemons broke his hand on the same play and had to leave the game. 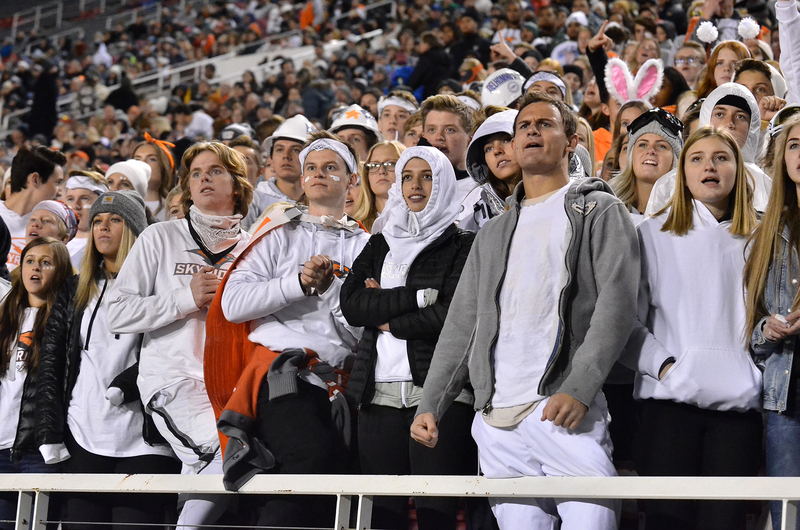 In the end, the Falcons fell 31-14 to an impressive Corner Canyon team. 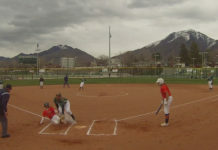 For the second year in a row, the Falcons advanced to the state championship only to come up just short of a victory. The Skyridge Falcons have seen much success in their brief, three-year program history including a Region 8 championship and two consecutive appearances in the 5A state final game. The future is bright for this strong, resilient, and hard-working group of dedicated football players.